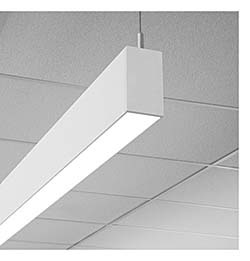 HP-2 D two-inch aperture direct pendant is a linear LED luminaire with a precision-cut extruded aluminum body, an internal joiner system, and a plug-together wiring standard. Reflectors are die-formed, cold-rolled steel finished with high reflectance, matte white, powder-coat paint. Available in either standard (18.5 watts) or high output (36 watts) models at 3000K, 3500K, and 4000K. High performance constant current reduction LED driver. Driver is fully accessible from below the ceiling. Includes emergency to generator/inverter wiring and internal generator transfer switch.